Denon’s Heos takes the pain out of AV receiver ownership, from set up to style, delivering strong audio performance with upgrade potential for the future. You’ve bought your sleek Denon Heos wireless speakers, you’re happy with the modern look and lack of cables, and they sound great when streaming music; but what if they could be used as wireless surround sound speakers on your home theater system? It’s not possible yet, but next year that will all change. It’s thanks to the Denon Heos AVR, a product that wants to take the pain out of looking at, and setting up, an AV receiver. 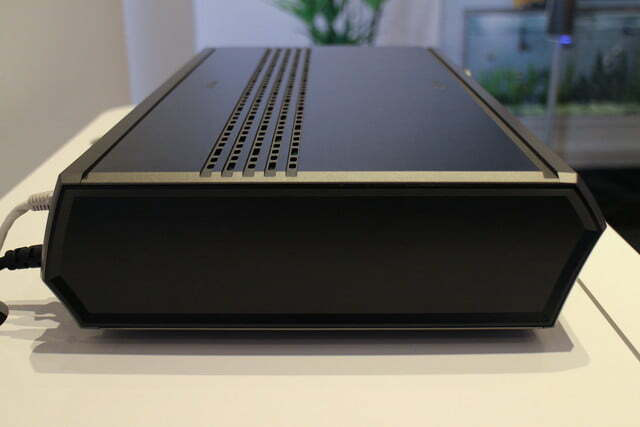 The Heos AVR looks nothing like a normal receiver. There’s a single control knob on the front, and that’s it. There’s no display, no little buttons, and no complicated slots or connections to figure out. It’s slim like a set top box, made from metal, finished in sleek gunmetal grey, and fitted with a pair of swish glowing blue accent lights — one under the box, and the other that illuminates only when the volume knob is turned. All the connections you need are either wireless and invisible, or tucked neatly around the back. Take a peek and you’ll spot four HDMI sockets that support the latest HDCP 2.2 version, ready to handle the latest 4K content. While the surround speakers are connected wirelessly, the fronts still have to be wired up. Although it doesn’t stream video, only audio, it’ll work from any source you plug in. 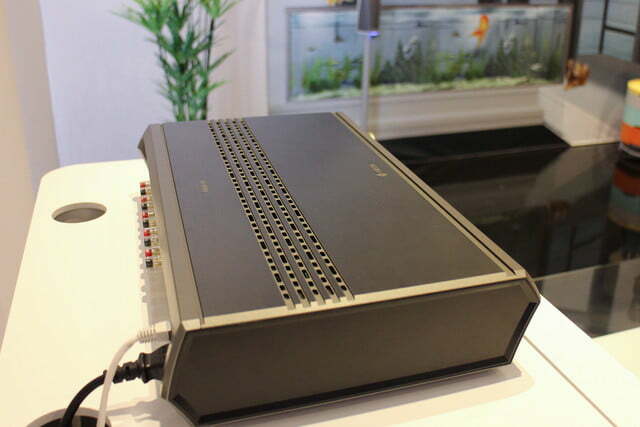 The simple setup and friendly design makes the Heos AVR very intriguing. 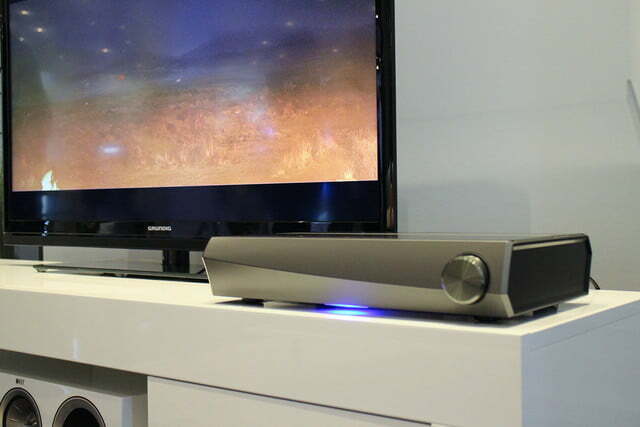 We checked out a movie streamed through an Apple TV, with the Heos AVR unit connected to KEF free-standing fronts, a center, and subwoofer, with Heos wireless speakers on stands behind. This was in a rather large conference room, so not the best listening environment, but the sound produced filled the space, with plenty of bass punch coming through during the closing sequence of Skyfall. 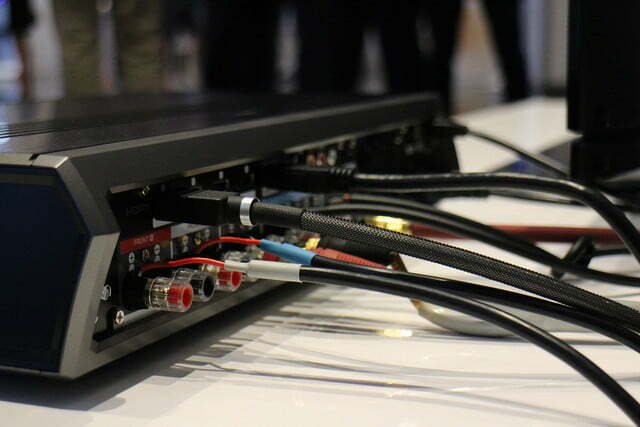 A Denon representative told Digital Trends that performance would be equal to many of its traditional AV receivers, but due to it being an early working version, the specification has yet to be finalized, so we don’t know about output power yet. However, it will only run 5.1 audio, and isn’t suitable for 7.1, Atmos, or DTS:X. 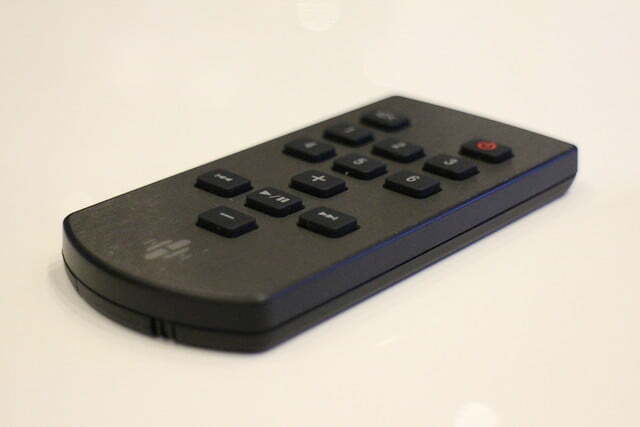 Connecting the Heos AVR system up to other Heos products will turn it into a multi-room entertainment hub, and it’s all controlled through the Heos app — from initial setup to multi-room control — no on-screen display necessary. This ease of use, combined with the simple setup and friendly design, plus the ability to make further use of your wireless speakers, makes the Heos AVR very intriguing. Sound from all-in-one home theater systems often suffered, but the accessibility was attractive. 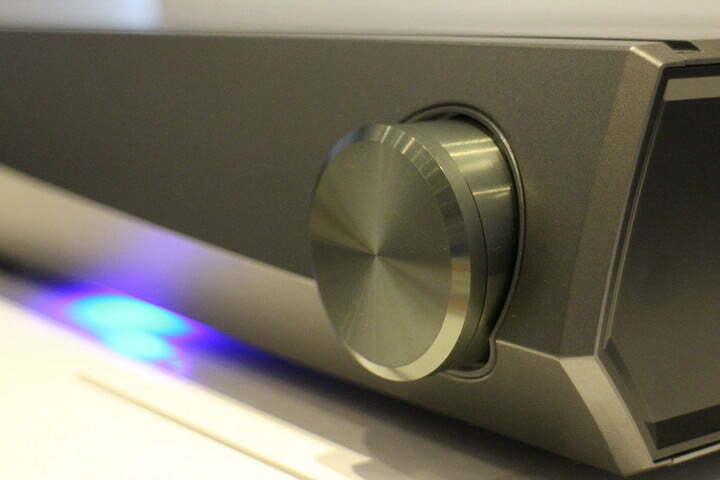 Denon takes sound seriously, and unlike an all-in-one or soundbar, the Heos AVR provides plenty of expansion potential, and goes about addressing ownership and continued use in a very modern way. It’s not made for enthusiasts keen on the power and features offered by a full-on AV receiver, but for those who want convenience and performance from a box they won’t want to hide away in the living room. 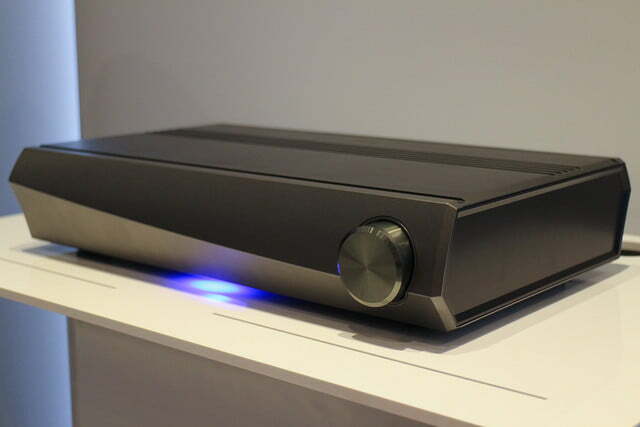 Denon intends to have the Heos AVR on sale early next year, tentatively saying it’ll be in February, and that’ll it’ll cost around 900 to 1,000 euros, which equates to about $1,020 to $1,130. 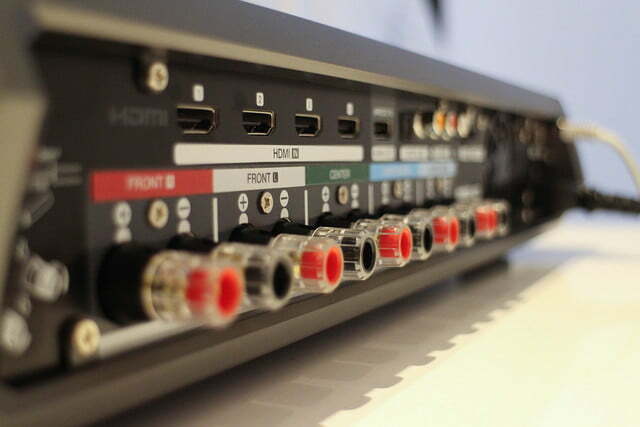 That’s not cheap, and you can buy a traditional AV receiver for less, but it won’t be as pretty or easy to use. What’s more, it’s a strong incentive to choose Denon’s Heos over Sonos, which only offers a soundbar, when shopping now for a wireless speaker setup. 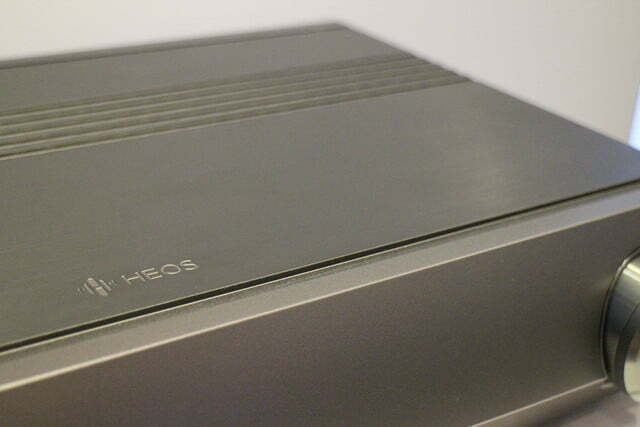 We should note here that the Heos AVR has not been introduced to the US just yet, so we’ll likely get more details once it is unleashed on this side of the pond. Stay tuned.